On a positive note, these are bright and loud bags that are highly visible on the shelves. The logo is prominent and the colors are commanding. However, Louisiana is home to some of America's most innovative, original and flamboyant art. 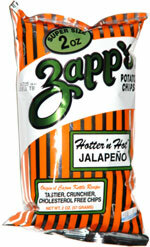 You would have thought Zapp's could have come up with someone that could at least match the flavor names with great packaging designs. You can't have the amount of undulations on the surface of a Chip that these have and not get a good crunch. They were oily and hardened in the cooking process. the crunch was rigid and robust and sustained until the Chip was virtually finished. When a Chips flavor claims to be Jalapeno, the first thing we hope for is a spicy Jalapeno flavor. The next is heat. Not a burn your mouth out heat, but something hot enough to admit it got you going. Of course, there are those that say, 'Nah, not hot', however hot something is, but these were hot. And most importantly, tasty. They tasted exactly like Jalapeno. However, all that said, they really needed to be a little hotter because after all, they do describe them as "Hotter 'n Hot"